Previous post: Preparation for Making Madder Lake. In the last post, I wrote that we’re beginning with about 100g of madder root and about 30g of potash alum. I also wrote that there was a big secret coming in this one. Well, read on! Most madder recipes I’ve seen online – including this one from Rubio Violins, which is the one I think most home chemists follow – have us putting the madder roots into water and cooking them up directly. These recipes leave out a crucial step, which is to wash the roots beforehand. One or two sources actually mention this washing, but do not mention the purpose of it, which is to remove extraneous dyes and other colors that the roots contain, and which will contaminate our lovely rose color if we leave them in there. So ‘washing’, in this case, means giving them a good soak, and then throwing out the bath water (without the baby, which is the rose dye that will not emerge until the roots are heated). Here I’ve got my roots soaking in water out of doors. I soak these roots for several days. It’s best to do this when it is relatively cool outdoors, as I’m doing here. As the madder roots rest, they ferment, so you’re likely to see some bubbles or foam on the surface at some point. If it’s too warm out, a lot of mold will be generated as well. I don’t think this mold actually interferes with the making of the pigment, but it does make it a little difficult to see what’s going on in there. 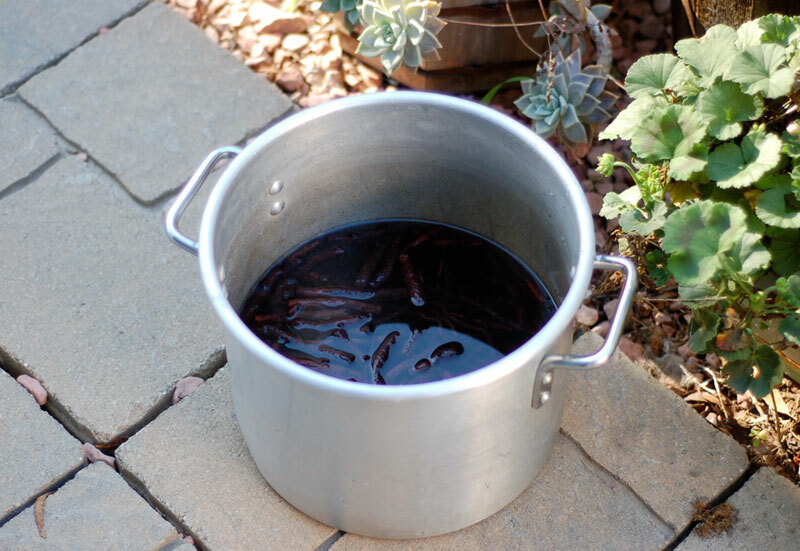 (Also, if it’s really hot, it might actually start cooking some of the alizarin dye out of the roots, and you definitely don’t want that yet.) So if it’s really warm out when you’re making your lake, consider moving the roots out of the sun – maybe even put them in the garage or something. When the roots have been sitting for several days, the water should look reddish gold. At this point, dump out the water. Yes, you read that right – dump it out! Do it! I know it looks like there’s a lot of color in there that you want to be saving and using. Trust me: it’s no good. It’s just contamination. It is exactly this stuff you’re looking at that makes the finished madder lake brown instead of rose. So dump it. This is the big secret. Keep going at this point: refill the pot with water and strain a few times, until it comes out fairly colorless. Then soak overnight again. Then empty and strain, then soak overnight. Keep doing this until there’s not much color coming out of the water. 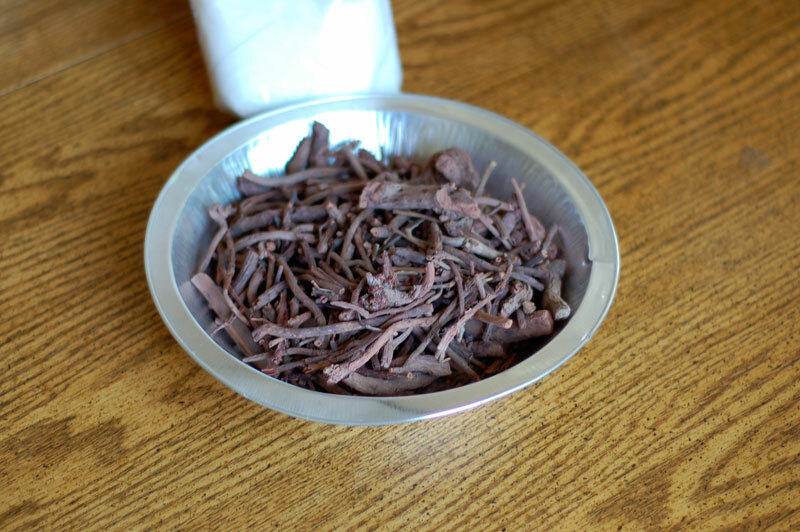 (The purple gunk doesn’t matter – that’s from the root bark.) This entire process may take a week, or even longer. Be patient: a good madder lake is worth the wait. At some point the emptied water will start to look clearer and more pink. Once that happens, we’re ready to make our madder lake. It’s time to make these posts at last, after many delays: How to Make Madder Lake. I’ve posted before about how to make a lake pigment – check this post here – and will make more posts about it in the future: about the different varieties of carmine lake, and how to make a proper yellow lake from weld, and so on. But madder lake is, well, different. It’s more involved to make a quality red lake from this dyestuff. Many have tried making madder lakes, only to be disappointed in the reddish-brown color that results, and have wondered how to make that exciting rose color we all love. As it turns out, there is one little secret that makes all the difference. Some history: madder lake is one of the older lake pigments, found to have been used on some rather ancient objects. But for most of the Middle Ages, some of the other red lakes – lac, brazilwood, etc. – were often preferred over madder. As Daniel Thompson puts it: “To make as good a lake from madder as any beginner can make from brazil wood calls for a good deal of expert chemical knowldege and careful manipulation; and there is no evidence to suggest that medieval colour-makers possessed the knowledge necessary to making good madder lakes.” (The Materials and Techniques of Medieval Painting, Daniel V. Thompson.) Madder lake, as an artist’s material, really came into its own in the Renaissance, being used as a glazing color for drapery and so on. Its popularity continued through the Baroque, Classical, and Romantic eras; one of its popular functions was as a glaze over vermilion in drapery, creating an intense and fairly stable red. In the Nineteenth Century, a process was discovered to make a very rich and powerful rose color from madder, using sulfuric acid. (There are some sources that report that this is when madder lake was invented; this is not true. It was this more powerful madder lake that was created at this time, a color named rose madder. It is this recipe, given by George Fields, that Winsor & Newton claim to still be using today.) We won’t be using sulfuric acid in this recipe, but we will still be able to make a nice rose-red madder lake by taking our time and following a procedure. Making madder lake may be more involved and time-consuming than some of the other lake pigments, but the results can be well worth the investment. Not only is it one of the most beautiful lakes, and an absolute joy for skin tones, but it is also, by all accounts, far more lightfast than any other natural lake pigment. It is the only natural lake, as far as I am aware, that is still in general use by artists, because it is the only one that is considered permanent enough for artistic use (at least as an oil paint). The stuff may not last forever, but it will last, as the man said, a goodish while. And, unlike the synthetic alizarin crimson, when it does fade it appears to fade slowly and gracefully over time, rather than disappearing all at once. The ingredients are simple and few: some madder root; potash alum; sodium carbonate (washing soda) or potassium carbonate (potash); and water. We’ll also need a slow cooker – or a little double-boiler setup that I’ll show later on – a thermometer, a large jar or two, some coffee filters and a funnel. The coffee filters: get some of the big flat-bottomed basket filters, not the cone-shaped ones – those have a tendency to spring leaks. We will begin with about 100g of roots, and about 30g of alum. This will make a small amount of lake pigment. Stay tuned – the big secret comes in the next post! You are currently browsing the Sunsikell blog archives for December, 2014.